This is your chance to own one of the few large-acreage properties available in the area. 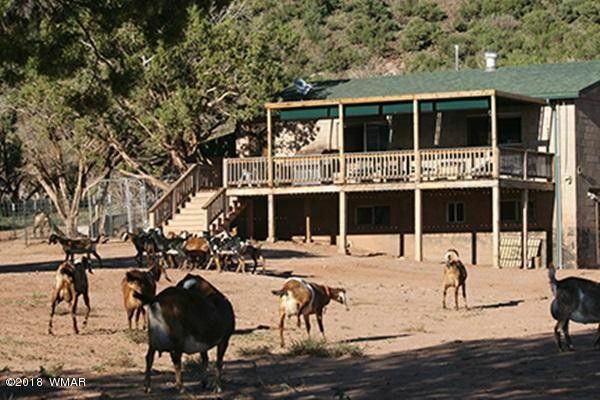 There is plenty of peaceful quiet, privacy, and room to roam on these 280 acres of gorgeous and varied high-desert land nestled up to scenic Black Mesa.The property, which spans from the top of the mesa to across the valley floor, includes abundant cedar trees, limestone cliffs, volcanic boulders, and lots of petrified wood. The area is also strewn with artifacts from when the Anasazi's lived here over a thousand years ago - including ornate pottery, metates, spear & arrow heads, there is even the remains of a kiva. From a later period, the wild west left its mark on this beautiful land with wooden corrals, an old loading chute, and a stone fireplace - remnants of cattle drives from the early 1900's The listing comprises of 2 homes, one of which is currently the Dairy building with approx. 2200 sq ft house The main house (The Bunk House), is approx. 2000 sq ft with 2 beds (potentially 3), 2 baths, laundry room. The Dairy has milking parlor, office, commercial kitchen, storage, and living quarters with a bathroom. There are also multiple other out buildings, and a large 40x50 Metal Barn/Shop. More details are included in the documents tab. The information shown on this listing is mostly for the main house. Directions: From Main Street, East on Concho Highway to Eldorado, South approx. 4 miles to San Carlos, take San Carlos all the way to the end, the property is on the left hand side.